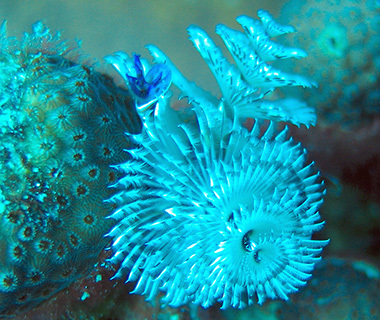 Christmas tree worms, Spirobranchus giganteus, are Christmas tree-shaped serpulid tube-dwelling worms with magnificent twin spirals of plumes used for feeding and respiration. 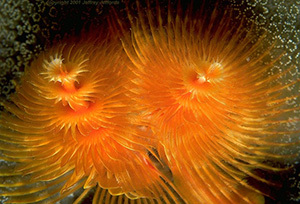 These cone-shaped worms are one of the most widely recognized sedentary polychaete worms. They come in many colors including orange, yellow, blue, and white and, though they are small with an average 3.8 cm in span, they are easily spotted due to their shape, beauty, and color. The colorful plumes, or tentacles, are used for passive feeding on suspended food particles and plankton in the water. The plumes are also used for respiration. Though the plumes are visible, most of these worms are anchored in their burrows that they bore into live calcareous coral. 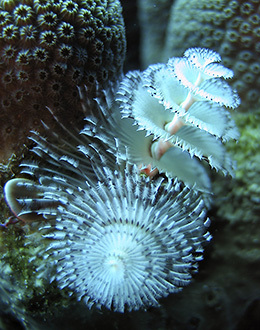 Christmas tree worms are very sensitive to disturbances and will rapidly retract into their burrows at the slightest touch or passing shadow. They typically re-emerge a minute later, very slowly, to test the water before fully extending their plumes. 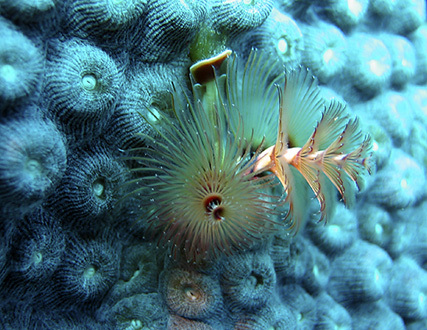 Christmas tree worms, Spirobranchus giganteus, are found on coral reefs in tropical waters worldwide. Christmas tree worms, Spirobranchus giganteus, are polychaete ciliary feeders that feed using their radioles, the hair-like appendages or “feathers” that circle outward from the central spine, to catch phytoplankton floating by in the water. The food is then passed down a food groove by ciliary tracts — lines of tiny hair-like extensions on the surface of cells that generate water currents to move food or mucus. The food particles are sorted and larger particles are discarded. Sand grains are directed to storage sacs to be used later for tube building. There are both male and female Christmas tree worms, Spirobranchus giganteus. They reproduce by casting their eggs and sperm into the water. The eggs are fertilized in the water then develop into larvae that settle on coral heads and then burrow into the coral to form their burrows. 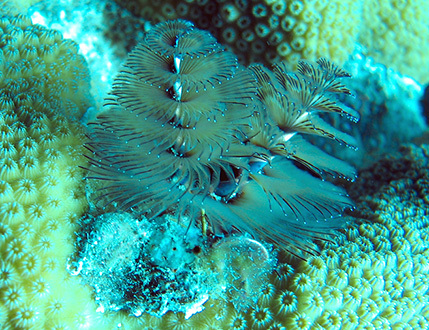 Christmas tree worms, Spirobranchus giganteus, are not dangerous to humans.